Gardeners in Wolverhampton can provide an important wildlife resource but their value is often overlooked. A well-manicured garden isn’t necessarily unfriendly to wildlife; with a few tweaks here and there, it’s possible to transform a formal garden into a mini-reserve. Adult butterflies need a regular supply of nectar, whilst their caterpillar young eat plants to get the essential protein that they need to grow. Favourite nectar plants in the garden include lavender and Buddleia bushes. Pruning Buddleia in March will ensure that it produces numerous flowers later in summer. Other border plants that provide nectar include Aubrietia, Marjoram, Red Valerian, Wallflower, Lilac and Thyme. Butterflies also need essential nutrients. They get these from soil, so set aside an area of damp open ground for them to use. Unlike butterflies, caterpillars need native plants to feed on. Unfortunately for the keen gardener, some of these are considered to be weeds. Nevertheless, by careful design, it is possible to incorporate some of these plants into your garden. If you have a secluded area in the garden such as behind the shed or the compost bin then you could try growing nettles (see below). If you are not keen on ‘weeds’, you could plant Cabbages or Nasturtiums to attract Large and Small White butterflies. So, with these small changes, you can enjoy butterflies all summer. STOP: Please don’t cut those nettles down! 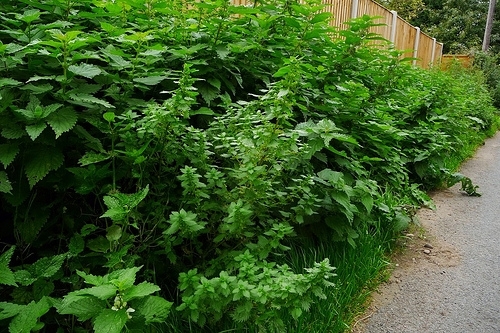 Nettles are often demonized by gardeners as being unsightly, painful and a general nuisance in the garden (and if you’ve ever been stung by one, there’s no denying that)! But there is a less well-known side to this much maligned plant. It is the primary food source of many of our most colourful butterflies and many birds such as the Wren and Blackcap will use it to nest in. In wintertime, the hollow stems provide shelter for insects which in turn provide food for birds at the time of year they most need it. So, by keeping nettles, you can provide a home for a wealth of wildlife. Song birds, Small Tortoiseshell, Comma, Red Admiral and Peacock butterflies will all benefit. You can limit the spread of nettles by growing them in a container sunk into the ground. Until next time – enjoy ‘Wolverhampton’s Great Outdoors’. For more on our wildlife, check out our Flickr site. This entry was posted in gardening, Wildlife and tagged butterflies, butterfly, environment, gardeners, gardening, habitat, moths, nettles, west midlands, wildlife, wolverhampton, wolverhampton's great outdoors. Bookmark the permalink.